An Exceptional Well Figured Regency Period Mahogany Side Cabinet of Rectangular form and good size proportions, first quarter of the Nineteenth Century. Attributed to Dublin furniture maker Williams & Gibton. 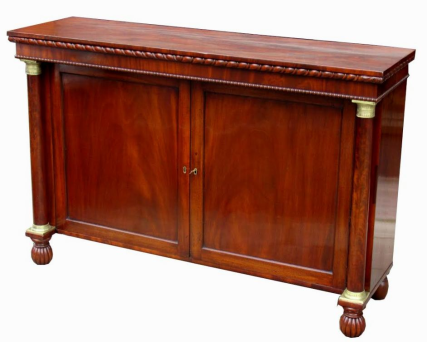 The rectangular well figured flame mahogany top with twin panelled hinged doors enclosing a single shelf, flanked by twin columns with attractive and very detailed brass mounts, ending on four reeded ball feet. 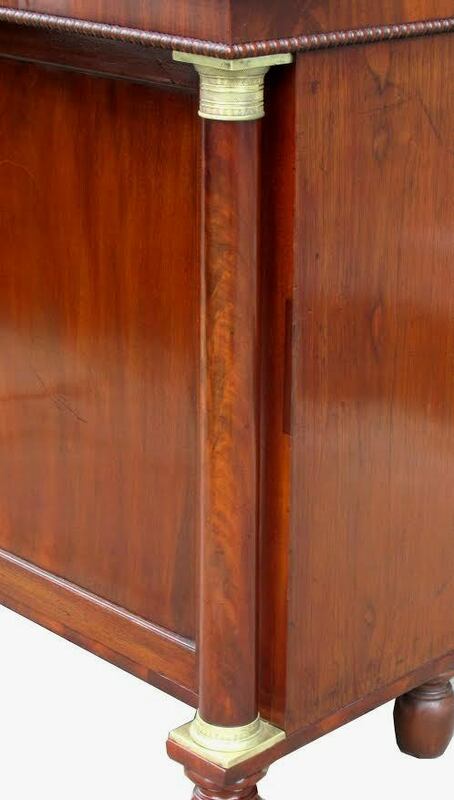 Condition: This piece is offered in very good professionally restored condition, nice surface patination. Width: 53.25” (135cm). Height: 35.5” (90cm). Depth: 19” (42cm). 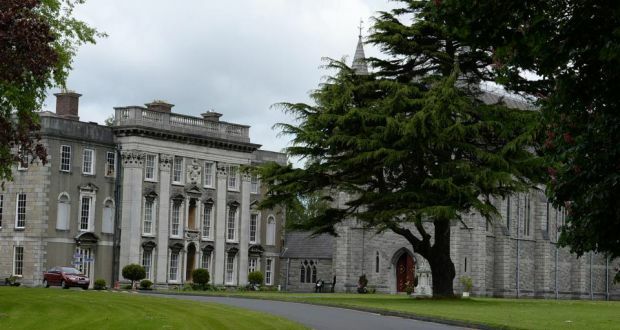 Provenance: All Hallows College (1892-2015) Drumcondra, Dublin, Ireland. 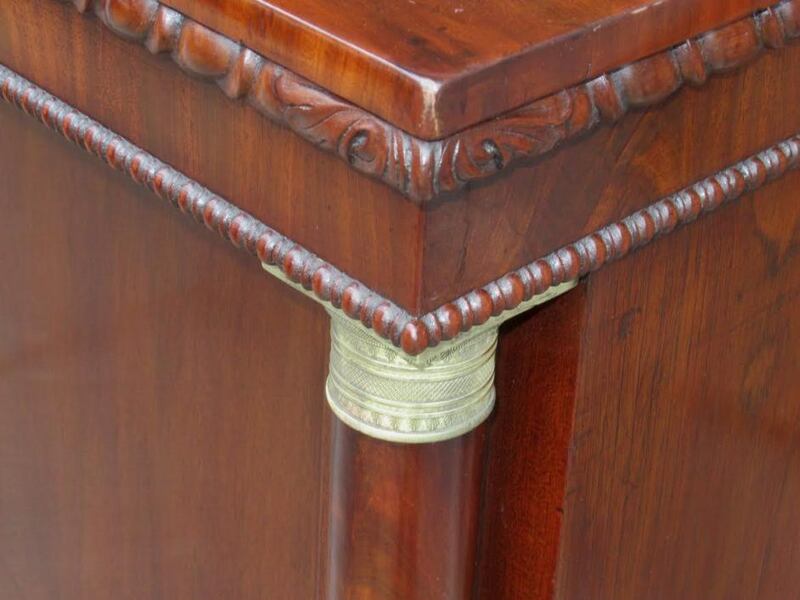 The highly successful Dublin firm of Mack, Williams and Gibton, whose furniture was often stamped with a series of numbers, and sometimes also labeled, was formed around 1812. 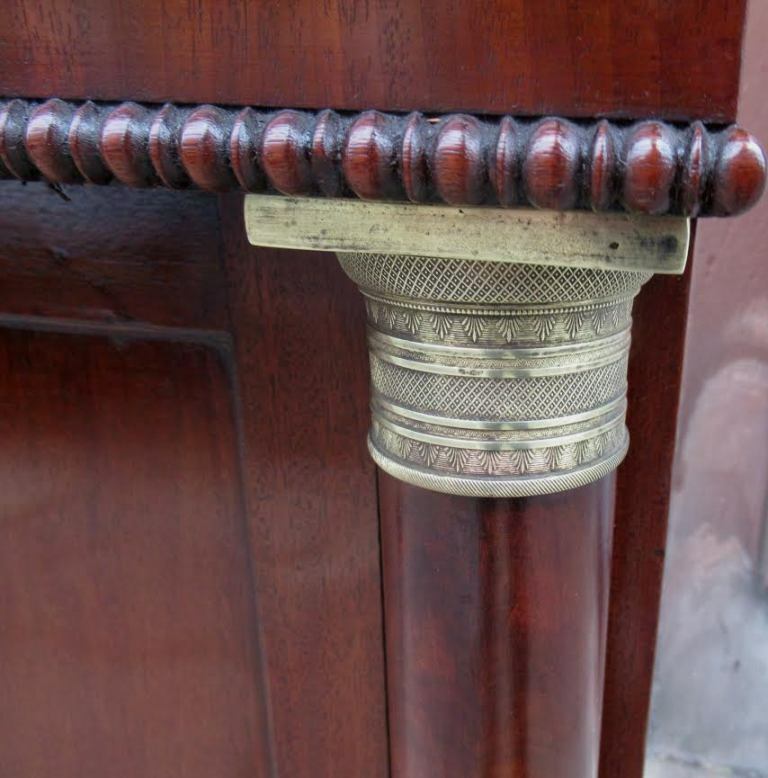 Its history can be traced to the latter part of the 18th century, when John Mack established a cabinet-making business in Abbey Street, Dublin. 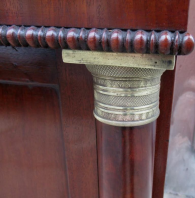 About 1801 Mack was joined by William Gibton and in 1806, Mack and Gibton received the ultimate accolade, being appointed 'Upholsterers and Cabinet Makers to his Majesty, His Excellency the Lord Lieutentant and His Majesty's Board of works.' Robert Gibton died in 1812 and was succeeded by his son William Gibton (1789-1842). At the same time, a former apprentice, Zachariah Williams, who had married Robert Gibton's daughter, joined the management, thus creating the new partnership of Mack, Williams and Gibton. Under this name the firm enjoyed unparalleled success, retaining its Royal Warrant for many years, supplying and restoring furniture for some of the most important public buildings in Ireland, including the Four Courts, the War Office, the Barracks Office, Dublin Castle, the Chapel Royal, and the Treasury and Viceregal Lodge. At the same time the firm undertook commissions for several major Irish country houses, such as Ballynegall, Co. Westmeath, Oakley Park, Co. Meath, and Strokestown, Co. Roscommon. Following the death of John Mack in 1829, the firm continued to trade under the names of the surviving partners, Williams and Gibton, and in 1844, two years after the death of William Gibton, it again changed its name to Williams and Sons, finally ceasing business in 1852.